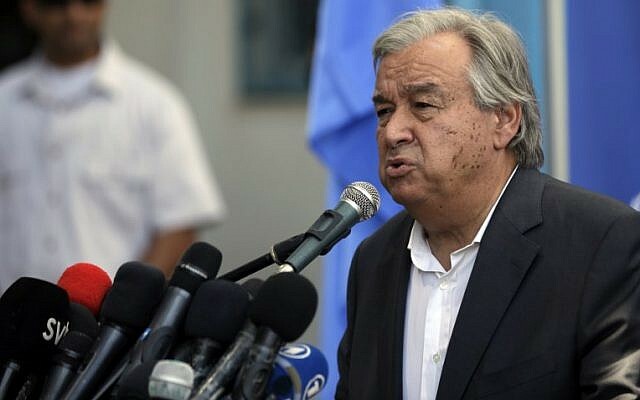 UN Chief Antonio Guterres ended Wednesday his three-day tour of Palestine and Israel by announcing $4 million aid for Gaza, which is living one of the worst humanitarian catastrophes the world have ever known. 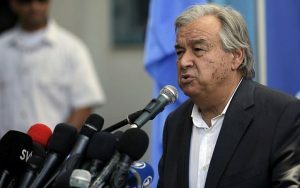 Guterres was in the enclaved Strip Wednesday on third day of his first tour in the region as UN Chief. Gazans have been living in almost complete darkness for months after Israel significantly reduced power supply to four hours in the day because of Palestinian President Mahmoud Abbas’s decision to cut payment of Gaza electricity bill. The cut in power supply has worsened the humanitarian condition in the Palestinian territory, which has been living under blockades. “I am deeply moved to be in Gaza today, unfortunately to witness one of the most dramatic humanitarian crises that I’ve seen in many years working as a humanitarian in the United Nations,” Guterres said. Israel has sealed off its border with the enclave since 2007, following control by the Strip by Hamas, which won Palestinian elections. Israel says the blockade is designed to prevent Hamas from staging terrorist attacks in Israel. Egypt, which shares border with Gaza, has also largely imposed a blockade – only opening border on occasions. Cairo has accused Hamas of helping weapon smuggling into restive Sinai. But a breakthrough took place lately after meetings between Egyptian and Hamas officials, who agreed to thaw their relations. Guterres also called on Israel and Egypt to lift the blockades. The UN Chief was in Ramallah Tuesday where he met with Palestinian authorities after meeting with Israeli Prime Minister Benjamin Netanyahu, on Monday. Guterres condemned Israel’s continued occupation of Palestinian territories and called on Palestinian authorities to stop backing attacks. Written by: KanelkaTagba on August 31, 2017. Posted by KanelkaTagba on Aug 31 2017. Filed under Headlines, World News. You can follow any responses to this entry through the RSS 2.0. Both comments and pings are currently closed.